Hello everyone, this build was my starter build for 3.6 that I accidentally pieced together over time. I was going to do another tectonic slam build while leveling with Facebreakers but I never found a point at which that build would become better, so I embraced it and adjusted my build to revolve around a Facebreaker instead. If you are an experienced player, just jump down to the skill tree and gear sections. Otherwise, read on! Are you tired of your character not doing any damage? Are you too poor to afford a Shavronne's Wrapping for your Low Life/ES build to work? Do you die on every map with your Chaos Inoculated build because ES gear costs way too much? Well, you are in the right place, screw the meta! With this build, you will do over 1 mil DPS, have over 6.9k eHP (with no clunky ES/MoM mechanics) as good old life, and the character will pay for itself as you build it, unlike the multitude of builds that require exalts to just get off the ground. With some additional investments (see ideal gear section), you can get to over 7 million PoB DPS while retaining your tankiness. So this is not only one of the most budget tectonic slam builds, but also one of the highest damage ones. Adding an Abyssus will give you an extra 1.7 million or so DPS on top of that, but you also die much faster so it isn't a trade-off that I like. Overall, I think this is one of, if not, the best rendition of a Tectonic Slam build since you spike in power at level 16 and just keep getting stronger and stronger as you level and get more currency for your gear. Eventually, you'll do about as much damage as a Molten Strike build for single target. Given the Juggernaut ascendancy and a 7k or slightly higher life pool, you will survive a hit from just about everything and be able to recover quickly from leech and regeneration. This combination of dishing out damage while tanking hits isn't very commonly seen among other builds. I have been playing the game since 2.6. I play Marauders almost exclusively, yes, even my spell casters are Marauders. I like to relax, not move, and tank everything to the face while playing games like PoE, and I like dishing out enough damage to blow bosses up. So, my builds reflect that play style. I really dislike the current 3.6 meta of squishy spell casters that cap out at a relatively low DPS of around 1 ~ 2 million after heavy investment, so I've been trying out many off meta builds. Look for a high damage roll. You can easily get a pair of 750%+ for 1 alc. Facebreakers get their damage from flat physical damage that you will get from other gear, jewels, or buffs. Tectonic slam is pretty self explanatory, it's a big AoE attack that offers physical to fire damage conversion. It also has a 35% chance of consuming an endurance charge to produce a Charged Slam (a huge AoE attack with 60% more damage). Defensively, you stay alive by having life regen and life leech. Having endurance charges along with flasks gives you additional damage mitigation. Note: Be sure to spec Resolute Technique as soon as you can when leveling. This build won't work without them. Get as close to 800% as possible, but don't go crazy and spend exalts, that would defeat the purpose of this build. The Lightpoacher is my favourite for mapping. It gives you an abyss jewel socket to get some life and flat damage. On top of that, the 5% life recovered on skill activation is instant and adds up to be about 15% of maximum life per second (attack rate is about 3 per second). We use only abyss jewels so we have at least 5 maximum charges. Look for 5% of maximum life recovered and 20% chance to gain a Spirit Charge on kill. Deidbell is a good offensive option, but I don't like how when you are dying... you just die harder with the can't leech life when low on life mod. Starkonja's Head is a good choice for bossing since it has life and attack speed. Dexterity is also welcome because we don't pick up many nodes in the tree. If you have trouble putting it on, get a high dexterity gear temporarily that puts you over 138, put on the Starkonja, then remove the temporary gear. As long as you have over 138 including the dexterity from the Starkonja, it will stay on. I don't recommend Abyssus at all (especially for running labs), but you can use one for a huge DPS boost if you are comfortable with the increased damage taken. Any 6L rare chest with life and some resists, these are about 15c early in the league or corrupt. You want 4R + 2B ideally, but having 1 green socket or 1 extra red/blue socket is still serviceable. Darkness Enthroned is a very good belt for this build because it gives us tons of damage for very little cost as long as you have abyss jewels to put in the sockets. If you put in 2 jewels with 6 damage and 34 life each, you'll essentially have 3 of them due to the 50% increased jewel effect mod. That is, it will become 18 flat damage and 102 life. Meginord's Girdle gives a lot of good stats we are looking for. 10% increased life, up to 20% cold resistance, 10 flat damage, up to 35 flat life from the strength, and up to 14% increased melee physical damage also from the strength. Look for high strength + cold resist rolls. The Great Old One's Ward gives us flat damage and attack speed. Can also use a rare shield with increased physical damage and attack speed if you'd like a more defensive option. Look for 16 damage and 10% attack speed if the cost is reasonable. Cheap boots with fire resist, life, 25% movement speed, and up to 7.5 flat damage. Unaffected by burning ground is a nice bonus for when you roll that map mod. From here, things can get a little pricier depending on the stats you are looking for, but you have about 12c left to play with if we go by the 30c in the title. This is your primary flat damage piece of accessory. Try to get at least 19 flat damage here with life, resists, and increased damage. % physical damage gained as extra fire can be good when combined with flat damage, but is not worth the cost most of the time. We want at least 12 flat damage from each ring, elemental damage with attacks or increased fire damage is welcomed too. You will need to get a lot of your resists on these, too, and life, so they can get a bit costly. I got the left one for 1c and the right one for 5c. Flat damage and life is what you are looking for on jewels. These make up a lot of the flat damage we get in the build so try to get them as early as possible (level 48 for T1 attack roll). Attack speed is optional but will make the jewel very costly. You can get these with 4 ~ 5 flat damage and 30 ~ 35 life for about 1alc to 1c each. The build has 4 jewel sockets in the tree and another 0 to 3 on gear depending on what you use, so these will take up the rest of the budget. Wise Oak for elemental penetration, which unarmed builds severely lack in. Make sure you keep your uncapped fire resistance the highest of all your elemental resists when gearing or else this flask won't work. Aim for 15% elemental damage penetration, but if you can't afford it, lower is fine too. Really cheap flask for up to 25% more damage and a ton of armour. Just make sure the target is against something or you might push them out of your attack range. Consecrated ground for more life regen and 40% increased damage. Use a Bottled Faith if you can afford it and have nothing else to throw currency at. Cinderswallow Urn gives us much needed life and mana sustain while mapping. 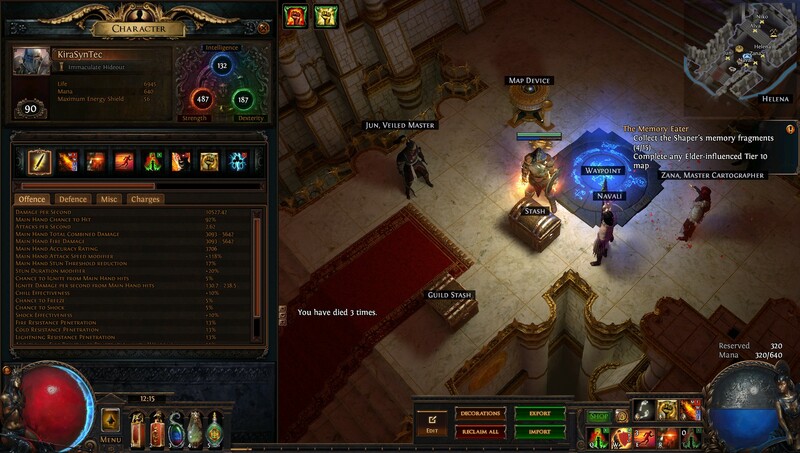 Look for a 3% life regenerated per second during flask effect crafted mod, and 3% life recovered on kill. WIP, updating as I discover more stuff. We have 50% mana unreserved so you can run any Aspect you like. I personally like Aspect of the Spider. 1. Decide on whether you would like to use a Loreweave or not. I personally like a rare 6L chest better. Either way, focus on getting a good rare chest piece first, since the price of a 6L Loreweave is much higher. 2. Circle of Guilt rings, they don't have to be double Herald of Purity rolls, but double Herald of Purity damage rolls do give us a lot of damage. 3. You'll need to replace your shield, boots, and Stygian Vise for resists now most likely, so focus on them. Fortify boots free up a gem slot, so I recommend picking that up first if they are cheap. 5. Here is when you hit the point of diminishing returns. Xoph's Blood and Bottled Faith both give you only slight improvements in damage and quality of life (<10% more damage each, Xoph's Blood gives you 2 passive points back). Pick your poison, or just don't bother. Elemental Weakness or Enfeeble on hit depending on your play style. Swap your curse on CWDT with a Wave of Conviction for -25% enemy fire resist. 6L Loreweave for extra flat damage, increased elemental damage with attacks, max resist. If you are short on resists, a 6L rare is your best friend. Xoph's Blood gives us life, fire penetration, and covers our enemies in ash making them take 20% increased fire damage. I really think Darkness Enthroned is BiS for this build, but you can use a good rare Stygian Vise if you are lacking resists, or a belt with life recovery rate to have more regen and leech. A rare shield with some offensive stats such as attack speed and attack/physical damage, life, and resists will be better than the Old One's Ward as it'll allow you to transition to using Circle of Guilts without nuking your resists. We are very short on gem slots due to not having a weapon and using a Lightpoacher (4 less than most builds), thus, having Fortify in the boots help. Compared to the Redblade Tramplers, you can get more movement speed, life, and resists here. With the Betrayal craft "Non-Vaal skills deal (30 ~ 60)% increased damage" suffix, you can actually outdo the Redblade Tramplers while bossing when you drop down your Vaal Ancestral Warchief. Enchant to look for is ideally attack and cast speed if you've killed recently, elemental penetration if you haven't killed recently is the runner up. Double Herald of Purity Circle of Guilt. This almost doubles the flat damage we get from Herald of Purity (up to 31 flat damage) and it gives us up to 60% increased physical damage, which adds tons of damage. We don't use an aura so... a Watcher's Eye wouldn't do anything. Dropping Herald of Ash for Vitality and using a life leech + recovery rate Watcher's Eye will make the build tankier, though. If you have an unchangeable green link, you can use a Faster Attacks, which doesn't give optimal DPS but is still more than enough. We swap out Added Fire Damage for Multistrike so we keep more leech instances up against a single target. Concentrated Effect boosts our damage by over 50% so it's useful for bossing. Good balance of damage taken to proc Immortal Call and the max (9%) attack speed from lightning golem. If you have a curse on your Facebreaker, use Blood Rage here instead of a curse. This lets us get the Fortify buff easily so we take 20% less damage. Blood magic is here so that we can spam Shield Charge to travel and not worry about running out of mana. Our life regeneration is much higher than the cost of the skill. If you have Fortify in your boots, drop Fortify and replace with an independent gem of your choice. I personally like Flame Dash here. Extra attack speed for more DPS. Also synergizes with the upgraded soul of Arakaali to get 50% increased recovery rate of life after immortal call procs. To get over terrain that you can't with shield charge, or through packs of mobs. Extra damage and decoys for monsters to target. More extra damage and exploding enemies on kill helps clear speed a bit. Extra damage buff + 2 totems to help output some damage while acting as decoys. There culling strike makes bossing a bit easier because they die at 10% life. Combustion penetrates 19% of the target's fire resistance, which gives us more DPS against pesky mobs with high fire resist. This is the version I run. This applies Fire Exposure to our enemies when they hit us, which decreases their fire resistance by 25%. If you have another free link, you can try using Vortex for dropping chilled ground when hit or Storm Brand if you would like to use Elemental Overload. The life recovery rate makes you heal a lot faster after taking large amounts of damage. Poison immunity prevents you from dying to poison DoT. This is my preferred setup, I use my character mainly as a mapping character so I like being able to 1 shot things with Resolute Technique and be a bit slower in bossing. Kill Hillock, get ground slam. Nice damage with the staff for ground slam. Can't be frozen is nice for act 1. The movement speed is also good. Is a really good leveling unique. If you can afford it, use a Lycosidae shield. You get your Facebreaker gloves at level 16. Equip those with 2 iron rings and a Meginord's Girdle. Grab a shield charge, this will kill most things on impact. For things that don't die, use Smite. The Deep One's Hide gives you 6 flat damage and some other nice stats. You can switch your rings for higher flat damage rings. Get a Deidbell to boost damage. These 2 uniques will help boost your damage and might stay with you forever. After this point, you can refer to the gear section to actually gear up fully. Grabbing the 2H damage nodes will make leveling smoother until you can afford a Facebreaker. Resolute Technique makes us unable to miss and quality of life is a lot higher. At this point we grabbed a lot of life nodes, the relevant leech nodes, and the tree is connected. We are level 50 something now and can definitely afford a Facebreaker, so we will unspec the 2H nodes. We get Resolute Technique as fast as possible to be able to reliably hit our targets. Unarmed attacks have 0% base crit anyways so there is no downside. This is right after unspec'ing RT. If you would prefer to wait until Uber lab to unspec it, it's also OK. Just grab Unbreakable instead for Merciless lab. Grab all the jewel sockets, elemental damage penetration, and Avatar of Fire. You should have a functional Wise Oak before you get Avatar of Fire, or you'll feel really sad hitting fire resistant rare mobs. I'll give a price breakdown and brief description, too, to give everyone an idea of how much it cost me to reach my stats in PoB. Take note that the cost reflects what I spent, and not the current market values, which may have changed over the course of the league. A single Herald of Purity roll will be more than good enough. Heck, even a rare ring with flat damage is more than good enough for just mapping. However, if you have the funds, this is where you want to start splurging after getting a nice 6L chest. I share this between all my life based attack builds so it was an extreme luxury pickup to make my life easier gearing for multiple builds. You really don't need this much resists on a Stygian Vise if you can find it somewhere else. I forgot that I would reserve life with the Blood Magic support, disregard the Aspect of the Spider craft. Picked up off the ground. This was also a luxury pickup as it can be used for many builds that I play. I have 6 Abyss Jewels equipped and averaged about 15c each, so that's another 90c. Which is approximately 25.5ex given the current exchange rate (~110c:1ex). It is possible to replace the Xoph's Blood, Stygian Vise, and Bottled Faith (19.7ex) with about 2ex of items and the build would only be about 10 to 15% weaker in damage output (for example, the gear I was using before fighting Shaper). The build has come a long way since its 30c days back at the start of Synthesis. The end result of all the expenditures add up to about 500 more life, and having 3.5 million more PoB DPS. Of course, I can't say that my character is budget anymore at this point in time, but it only ended up this way because I wanted to push this build as far as I could. With the budget setup, you can still comfortably do all maps and probably even endgame content if you have better reflexes than I do. To be honest, I don't even notice a difference with my character now vs the first week of Synthesis outside of boss fights and the occasional tanky rare mob. For gloves, none of them are amazing. I think "Of Light" or "Of Reflection" is as good as it gets, and they are both very mediocre with this build. That's what I recommend corrupted curse on hit Facebreaker instead. For boots, the best one is increased attack/cast speed if you have killed recently for mapping. The alternative is damage penetrates elemental resistances if you haven't killed recently for bossing. For helmet, we want Tectonic Slam has 20% chance to create a charged slam. I personally like Lightpoacher as the base while mapping, but a Starkonja's Head, a rare helmet, Devoto's Devotion, or anything you prefer are all solid choices, too. It's a mere increase of 6.45% more DPS. 40% increased tectonic slam damage will perform similarly in practice, maybe slightly worse. Getting 7 to 9 more flat damage will also make up for that gap for most people. It is, however, a nice quality of life upgrade to have almost a 50% chance to proc a charged slam. In theory, the build has the stats to do everything but elemental reflect and maybe no leech content. As a player, I'm mechanically unskilled so I'm skill capped there. 2. Why do you not take Elemental Overload? Unarmed has 0% base crit and thus cannot proc elemental overload without added crit chance from elsewhere. You could use a spell to proc it, but then you can't use Resolute Technique and will take up an additional gem slot so it's something you'll have to decide for your own play style. 3. Is this build HC viable? I don't play HC, but I've died 3 times so far getting to 90. Once in act 2 to a Synthesis memory fragment. Once in act 7 because I had my left hand holding a snack instead of being on the keyboard, so I couldn't dash out of a pile of exploding corpses + degeneration. The last time was in a map to a breach lord that spawned and murdered me out of nowhere. I'm not a very careful player so I think someone should be able to make it work. 4. Hitting a rare mob feels like a wet noodle fight! i. Make sure you have Wave of Conviction activating on a level 1 CWDT, this applies a -25% fire resistance debuff to enemies hit. This build isn't extremely tanky, after all, we gave up the weapon + glove slot for defenses and are trying to get physical damage on everything possible. That being said, play style wise, you can try to use tectonic slam earlier so the mobs don't get in range to hit you. The Lightpoacher helmet also helps a lot with instant life recovery while mapping, which this build lacks otherwise. During boss fights, know the boss mechanics well and dodge the big hits. Also remember to use Multistrike to keep leech instances up. For traps, go carefully and don't run through them recklessly. This build has about as much life recovery per second as a RF build (around 35%/s while bossing and 50%/s while mapping), which while is on the squishy side in my personal opinion, most builds don't have this much recovery potential. Added new videos and gifs. Updated gear and skill gems sections. Added cost of my current gear. Added note about bossing gems vs mapping gems. Updated flasks section to include Bottled Faith and Cinderswallow Urn. Updated ideal gear section with corrupted Facebreaker and Wave of Conviction. Updated skill gems and FAQ to include Combustion. Will do when I have some free time! Nice build bro. Going smooth for now. But after the initial beginner tree i don't know which way to go in the skill tree. When will i take the avatar of fire for example. Can you give some leveling skill tree directions. A non detailed explanation would be perfect. Thanks for the build and good luck! Like the build so far. Only act 10 to go before mapping and already doing an insane amount of damage. Tooltip in HO: 36622 dps. Got the Lightpoacher with a 30% increased flammability enchant with a decent 18% charge chance, but only 4% life recovery for just 1 fusing. A better one when currency allows for it. Yeah, I'll add in a couple more trees when I get some time. Been a bit busy with life + leveling my own character to test a few things out. My own personal preference is on taking the life node wheel, then some damage nodes at the bottom of the tree because this build already does a lot of damage and you just need to focus on staying alive. Avatar of Fire is a double edged sword: it gives us more damage, but because we don't have much elemental penetration on the tree due to being unarmed, it actually makes life harder against mobs with high fire resist. The effects are mitigated by flammability + wise oak, though. On the plus side, it lets us run physical reflection maps. So as long as you are still one shotting mobs, there's no real need to rush it. I feel like I took it too early and then had a tough time dealing with fire resistant mobs when I didn't have my wise oak. It's only going to get better from here! My current tooltip in hideout is a little shy of 140k at level 89. I worked the Lightpoacher in when I got to yellow tier maps and felt a bit squishy, I was using an enchanted Geofri's unique helmet until then. As long as you don't feel like you are too squishy, then it's fine putting off using a Lightpoacher.